ST. PAUL -- Democracy Now! host Amy Goodman and producers Sharif Abdel Kouddous and Nicole Salazar have all been released from police custody in St. Paul following their illegal arrest by Minneapolis Police on Monday afternoon. All three were violently manhandled by law enforcement officers. Abdel Kouddous was slammed against a wall and the ground, leaving his arms scraped and bloodied. He sustained other injuries to his chest and back. Salazar's violent arrest by baton-wielding officers, during which she was slammed to the ground while yelling, "I'm Press! Press!," resulted in her nose bleeding, as well as causing facial pain. 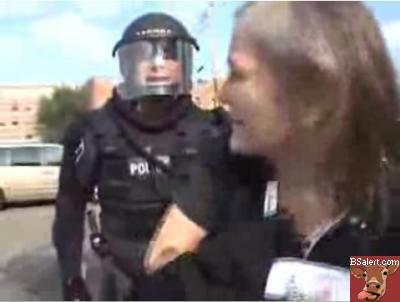 Goodman's arm was violently yanked by police as she was arrested. On Tuesday, Democracy Now! will broadcast video of these arrests, as well as the broader police action. These will also be available on: www.democracynow.org. Goodman was arrested while questioning police about the unlawful detention of Kouddous and Salazar who were arrested while they carried out their journalistic duties in covering street demonstrations at the Republican National Convention. Goodman's crime appears to have been defending her colleagues and the freedom of the press. Ramsey County Sheriff Bob Fletcher told Democracy Now! that Kouddous and Salazar were arrested on suspicion of rioting, a felony. While the three have been released, they all still face charges stemming from their unlawful arrest. Kouddous and Salazar face pending charges of suspicion of felony riot, while Goodman has been officially charged with obstruction of a legal process and interference with a "peace officer." Democracy Now! forcefully rejects all of these charges as false and an attempt at intimidation of these journalists. We demand that the charges be immediately and completely dropped. Democracy Now! stands by Goodman, Kouddous and Salazar and condemns this action by Twin Cities' law enforcement as a clear violation of the freedom of the press and the First Amendment rights of these journalists. During the demonstration in which the Democracy Now! team was arrested, law enforcement officers used pepper spray, rubber bullets, concussion grenades and excessive force against protesters and journalists. Several dozen demonstrators were also arrested during this action, including a photographer for the Associated Press. Amy Goodman is one of the most well-known and well-respected journalists in the United States. She has received journalism's top honors for her reporting and has a distinguished reputation of bravery and courage. The arrest of Goodman, Kouddous and Salazar and the subsequent criminal charges and threat of charges are a transparent attempt to intimidate journalists. ST. PAUL, Minn. -- Government crackdowns on journalists are a true threat to democracy. As the Republican National Convention meets in St. Paul, Minn., this week, police are systematically targeting journalists. I was arrested with my two colleagues, “Democracy Now!” producers Sharif Abdel Kouddous and Nicole Salazar, while reporting on the first day of the RNC. I have been wrongly charged with a misdemeanor. My co-workers, who were simply reporting, may be charged with felony riot. Behind all the patriotic hyperbole that accompanies the conventions, and the thousands of journalists and media workers who arrive to cover the staged events, there are serious violations of the basic right of freedom of the press. Here on the streets of St. Paul, the press is free to report on the official proceedings of the RNC, but not to report on the police violence and mass arrests directed at those who have come to petition their government, to protest. It was Labor Day, and there was an anti-war march, with a huge turnout, with local families, students, veterans and people from around the country gathered to oppose the war. The protesters greatly outnumbered the Republican delegates. There was a positive, festive feeling, coupled with a growing anxiety about the course that Hurricane Gustav was taking, and whether New Orleans would be devastated anew. Later in the day, there was a splinter march. The police -- clad in full body armor, with helmets, face shields, batons and canisters of pepper spray -- charged. They forced marchers, onlookers and working journalists into a nearby parking lot, then surrounded the people and began handcuffing them. Nicole was videotaping. Her tape of her own violent arrest is chilling. Police in riot gear charged her, yelling, “Get down on your face.” You hear her voice, clearly and repeatedly announcing “Press! Press! Where are we supposed to go?” She was trapped between parked cars. The camera drops to the pavement amidst Nicole’s screams of pain. Her face was smashed into the pavement, and she was bleeding from the nose, with the heavy officer with a boot or knee on her back. Another officer was pulling on her leg. Sharif was thrown up against the wall and kicked in the chest, and he was bleeding from his arm. I was at the Xcel Center on the convention floor, interviewing delegates. I had just made it to the Minnesota delegation when I got a call on my cell phone with news that Sharif and Nicole were being bloody arrested, in every sense. Filmmaker Rick Rowley of Big Noise Films and I raced on foot to the scene. Out of breath, we arrived at the parking lot. I went up to the line of riot police and asked to speak to a commanding officer, saying that they had arrested accredited journalists. Within seconds, they grabbed me, pulled me behind the police line and forcibly twisted my arms behind my back and handcuffed me, the rigid plastic cuffs digging into my wrists. I saw Sharif, his arm bloody, his credentials hanging from his neck. I repeated we were accredited journalists, whereupon a Secret Service agent came over and ripped my convention credential from my neck. I was taken to the St. Paul police garage where cages were set up for protesters. I was charged with obstruction of a peace officer. Nicole and Sharif were taken to jail, facing riot charges. On Monday night, hours after we were arrested, after much public outcry, Nicole, Sharif and I were released. That was our Labor Day. It’s all in a day’s work. Amy Goodman is the host of “Democracy Now!,” a daily international TV/radio news hour airing on more than 700 stations in North America. I'm glad this is getting so much play on the mainstream news. I'd hate to have to sit through commentators talking about complete non-events, while riot police are beating the piss out of citizens in the streets. The exceptional coverage by Fox News was especially suprising. I would have figured they would have some guy in a poncho getting rained on, or constant coverage of an empty arena, but no, they stuck by us and covered this story. Kudos Fox News for absolutely never suprising anyone. That's interesting. I am without power in Louisiana after the hurricane so I haven't caught any of this on tv, but good to know network media is picking it up.